So I know that everyone is not my personal Facebook friend or a follower on my Facebook Page (you should be following my page though! Please go like it :-), so you may not have heard my news. I've accepted a full-time position y'all :-o! And I'm actually excited about it. Even looking forward to it! I'll let that settle in. That was the last job I had that *fit me*; that was work I was personally really jazzed about doing and felt in complete alignment with. I was the adult program coordinator - creating programs for adults to be able to utilize the green spaces in various classes and learning opportunities. It was a pretty fantastic job, especially for me at the time, being the INFJ that I am. But at the same time, I was also running my non-profit organization Soulistic Sanctuary and deeply devoted to the mission of educating lower income communities on holistic living principles. Because of this, I always saw that job as a means to an end. It was just the thing I had to do while I was making this dream goal come true. And you know what happened? In a lot of ways, I totally missed the awesomeness of that job. It slipped right past me as I was pushing myself to work on my dreams at all costs (and even work hours) and make them happen. Though I'm not going to completely beat myself up because I did do a lot of good work there that I was completely present for, I also spent a good portion of that time wishing I was doing something else. And that's what I am going to make sure that I don't do with this new position. I know, what is it already right? 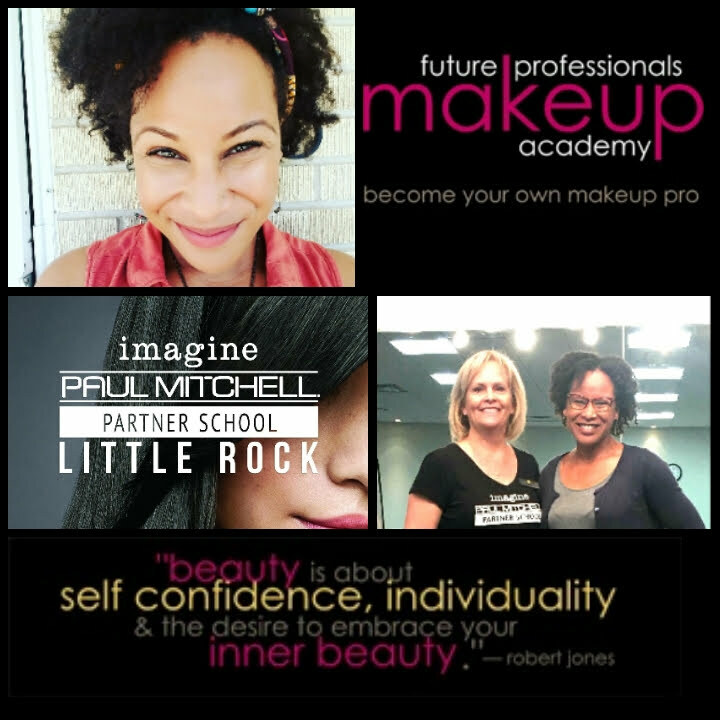 I've accepted the role as the Leader of the Future Professionals Makeup Academy at Paul Mitchell Cosmetology School here in Little Rock :-D. Yes, I'm beaming :-). In so many ways, just like that job at the conservatory, it's perfect for me. Completely aligned. Something that landed in my life absolutely out of the blue (but of course not really because I attracted it to me with all of my mindset and receiving work). I'll be working with enthusiastic students to help them develop awesome technical skills while also developing a level of empathy and depth of emotional understanding of the huge impact their work can have on the world they interact with. I'll be able to take a program that hasn't had a leader and help it blossom into something amazing and inspiring and fun (fun is big. Makeup is so much fun :-D). I'll be fulfilling a long-held dream to be a beauty industry instructor - I always wanted to pursue my esthetics instructor license but hadn't had the chance. Now I get to teach skincare AND makeup. How much more awesome could that be? And in truth, I will still be able to mentor. I will still be able to coach. I will still be able to share what I've learned about having the strength, confidence and tenacity to hit road bump after road bump and with audacity, keep getting up and claiming your happiness and your *right* to the life you desire (Dancing on the Ashes). And MOVE Makeup will still live and if anything, will experience even more exposure and growth. I'm excited to be moving away from doing all the things anyway ;-). So I'm saying all this to say that this time around, I'm going to completely immerse myself in this new role. I'm going to see it as the actual next step, not as the thing I'm doing while I'm also doing/getting to the next step. Do you see the subtle yet extremely significant difference there? I will not make myself run myself ragged. I will not tell myself that I'm not doing enough. I will instead allow myself to see the synchronicities and the EASE. I will receive the inevitable connections that will undoubtedly come and I will engage in them. I will continuously claim my right to take the easier route and achieve my dreams the easiest way. I will let it be fun and easy and I will move fully into all of this newness knowing that this path is the perfect one. This is what my reading above says to me and this is what my Soul knows and wants me to embrace. And I'm saying yes to all of that :-). And so now, I ask you these same questions. What does your Soul know about whatever issue you have before you and where are you giving yourself extra work to do, when what you truly want is already right there; you just need a perspective shift? I'd love for you to share, either in the comments or via email. If you need help with the perspective shifting, I am here :).